Description: Among the newer lineup of footpunkz, she is a favorite and it's easy to see why...this lovely gal never disappoints. Watch as Kathleen strips off her fishnets and shoves her perfect toes and soft soles right up to you. Don't miss it! Description: The lovely Kathleen is back with her perfect soles and she's down to give you an up close view! In this set, she starts out in socks and slowly peels them off, giving you a nice detailed view of her feet. This girl knows how to tease, and you definitely don't want to miss it. Description: Sorry for the huge delay, I've had a hell of a rough new year..but I won't bore you with that, I hope you enjoy the new site layout, and this killer new set of KutieKathleen! I will be get back to updating on a regular basis, so if you're a fan, make sure you stick around. Enjoy! Description: New Model alert! 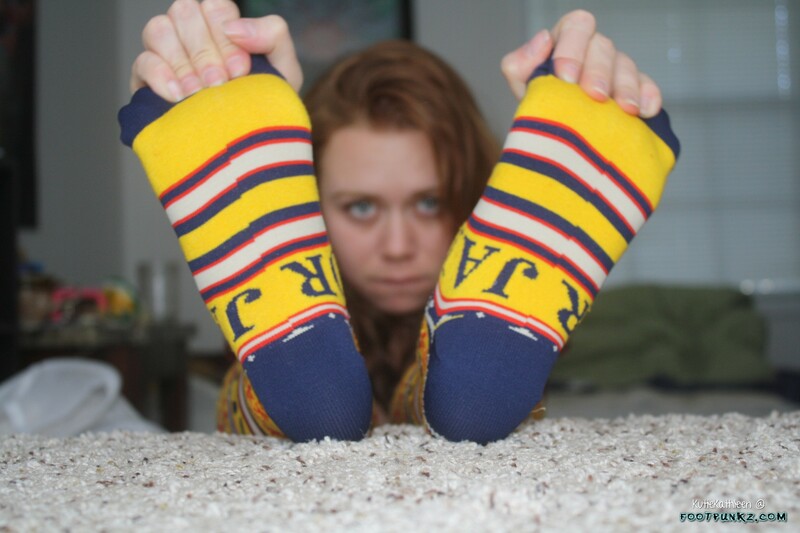 This is a gal I'm very excited to be adding to the footpunkz crew. Perfect toes and (finally!) a redhead! Sooo..as soon as she hit me up and I saw her feet, I knew I had to have her on the site. For her first set, Kathleen shoves her feet right up up in the camera, strips off her socks shows off her soles for you. Lots of Kathleen coming, don't miss it!